Billions of people have lived on the planet Earth since the Nobel prizes first began to be awarded. Only a few thousand have ever won one. Far fewer have won two. And only one person of all those billions has won two Nobel prizes in two different sciences. That person was the Polish-French physicist Marie Curie. She was born Maria Skłodowska in Warsaw in 1867. Poland was then part of the Russian empire and for generations her family had been part of the struggle for Polish independence. They had suffered for it and could not afford to give their children the best education then available. Maria’s favourite subjects – physics, chemistry and mathematics – made it even harder for her, because they were thought of as subjects for boys, not girls. But her intelligence and hard work enabled her to overcome all these difficulties and in 1891 she travelled to France to complete her training at the University of Paris. France changed her life in two ways, one minor, one major. She began to call herself Marie and she met the man who would later become her husband, the scientist Pierre Curie. They would collaborate on work that would make them both world-famous, but also lead to Marie’s premature death from cancer. After she married Pierre in 1895, Marie began to investigate the then mysterious properties of the element uranium. It had been discovered that uranium emitted rays that, like X-rays, could affect photographic plates. In other words, uranium was radioactive and she conducting some of the earliest research into this little understood phenomenon. She discovered that another element, thorium, was also radioactive and Pierre joined her in the research. Together they processed literally tons of uranium ore to discover two more radioactive elements: first polonium, which she named after her homeland, and then the even more radioactive radium. In 1903, she and Pierre were awarded the Nobel Prize for Physics with Pierre’s countryman Henri Becquerel, who had first discovered the radioactivity of uranium. But no-one at the time realized that radiation was harmful in powerful or prolonged doses. Marie and Pierre had been soaking their bodies in dangerous rays, but Pierre did not live long enough for the effects to become apparent. In 1906 this pioneer of the modern age was killed in a very old-fashioned way: he was run over by a horse-drawn vehicle while crossing the street. Marie’s life from then on would sometimes be difficult. Many in the French public and media were suspicious of her as a foreigner, but she was helped by her second Nobel prize, this time for Chemistry in 1911, and by the work she did for the French army during the First World War. She organized mobile X-ray units for wounded soldiers, helping save countless lives. Her fame was now immense, but she was never changed by it: she lived as modestly and quietly as ever, devoting herself to her research and to causes like Polish independence and international cooperation in science. By now Irène and Ève, the two daughters she had had with Pierre, were fully grown and able to help their mother in her work. Irène followed her into science, studying at the Curie Institute in Paris, and would also win a Nobel prize with her husband. That was in 1935, a year after her mother’s death from a condition called aplastic anaemia. The illness was almost certainly caused by Marie’s work with radium and other radioactive elements. Even the notes she made during her work now have to be kept in lead-lined boxes and scholars who want to study them have to wear protective clothing. Her premature death ended what had never been an easy life, but her intelligence, hard work and modesty still make her one of the most admirable scientists in history. 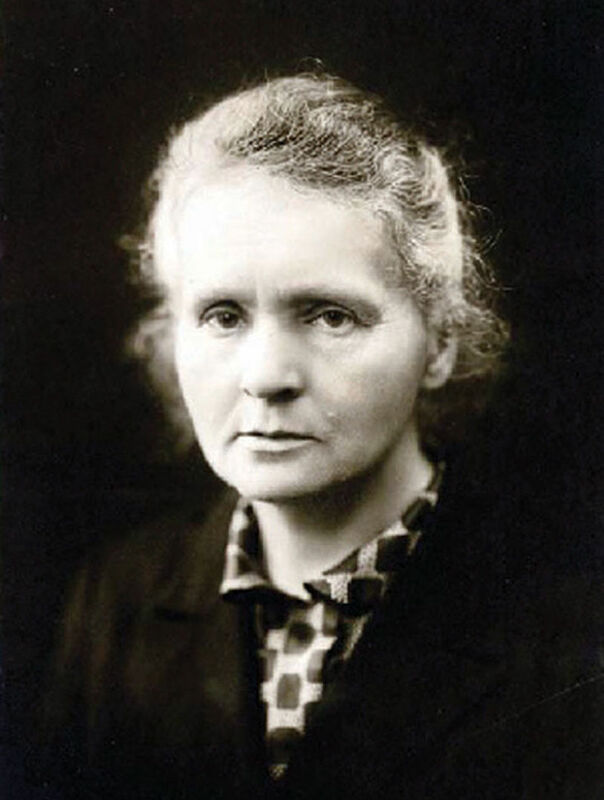 Marie Curie was a giant of science who eventually paid with her life for helping to unlock the secrets of radioactivity. Marie Curie cancer charity is named after her, which is why her name is famous today to many people who do not know anything about her life or achievements. Radiation can cause cancer but also help to cure it and her work also contributed hugely to medicine. Goodness and greatness don’t always go together, but Marie Curie combined the two in a way that will continue to inspire for centuries to come.